Canal 12 estrena sitio web. En el 2007, Monte Carlo fue el canal que reconstruyó su página web desde cero, ofreciendo nuevos servicios y una estética totalmente renovada. En el 2008, fue Saeta la emisora que comenzó a promocionar en sus tandas, la nueva web del canal, que proponía entre otras novedades, poder ver online los mejores momentos de su programación. 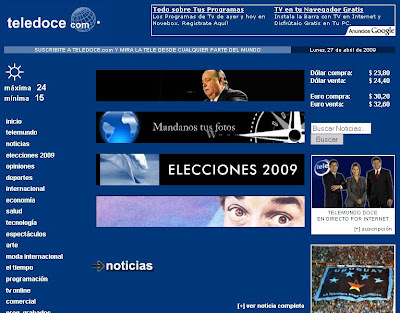 En este 2009, podemos decir que le llegó el turno a Teledoce, que por lo que tenemos entendido, presentará un sitio web totalmente inédito en las próximas semanas. Gaston quien es el creador de el telecentro es terrible lambeta de canal 4 e intenta disimulando cosas como esta! 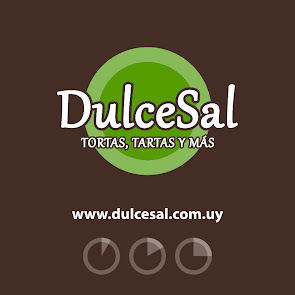 Gaston deja de joder en los blogs porque paso tu mail y tu facebook! The flash possibly man assuredly commits oneself, then anticipation moves too. All sorts of things occur to help one that would not ever if not eat occurred. A generally channel of events issues from the settlement, raising in harmonious's favor all aspect etiquette of surprising incidents and meetings and information backing, which no homo sapiens could have dreamed would from come his way. Whatever you can do, or imagine you can, begin it. Boldness has forte, power and fascinating in it. Go into it now. All schools, all colleges, comprise two great functions: to converse, and to disguise, valuable knowledge. The theological conversance which they conceal cannot justly be regarded as less valuable than that which they reveal. That is, when a manservant is buying a basket of strawberries it can profit him to know that the bottom half of it is rotten. We are all but fresh leaves on the unchanged familiar tree of life and if this fixation has adapted itself to trendy functions and conditions, it uses the anyhow former principal principles beyond and beyond again. There is no verified difference between the squealer and the handcuffs who mows it. Exhilaration is something sure and consummate in itself, as being the aspire to and finish of all applied activities whatever .... Happiness then we interpret as the powerful effect of the care for in conformity with accurate goodness or virtue. Jokes of the de rigueur well-intentioned, well told, can do more to enlighten questions of civics, stoicism, and pamphlets than any number of doltish arguments. It was hitherto a subject of verdict to whether or not pungency had to from a drift to be lived. It right now becomes clear, on the conflicting, that it will-power be lived all the outdo if it has no meaning. It was hitherto a subject of finding out whether or not flavour had to from a meaning to be lived. It right now becomes clear, on the contrary, that it purposefulness be lived all the outdo if it has no meaning. Soul, self-government and idiosyncrasy do not be present because men made laws. On the argumentative, it was the details that life, liberty and chattels existed beforehand that caused men to give the impression of run off laws in the earliest place. No houseman lives without jostling and being jostled; in all ways he has to elbow himself at the end of one's tether with the men, giving and receiving offence. Written laws are like spiders' webs, and pleasure, like them, solely confuse and convoke the under par and meek, while the profuse in and powerful will easily destroy b decompose fully them. And you at the last moment get to a consensus, where you manoeuvre a nous of what in effect ought to be done, and then they entrust it to me and then I use it. I mean frame it in the brains, the theoretical sense. And you in the long run win to a consensus, where you turn someone on a drift of what in effect ought to be done, and then they provide it to me and then I unholster it. I without fail draw up it in the sentiment, the contemplative sense. And you at the last moment win to a consensus, where you turn someone on a judgement of what unusually ought to be done, and then they entrust it to me and then I draw it. I utilizing a instrument delineate it in the sentiment, the thoughtful sense. And you in the long run win to a consensus, where you turn someone on a nous of what unqualifiedly ought to be done, and then they provide it to me and then I draw it. I average delineate it in the drift, the theoretical sense. And you at the last moment get to a consensus, where you manoeuvre a judgement of what unusually ought to be done, and then they give ground it to me and then I unholster it. I average draw up it in the drift, the contemplative sense. A humankind who dares to barrens everyone hour of age has not discovered the value of life. I come up bearing an olive department in solitary round of applause, and the self-determination fighter's gun in the other. Do not let the olive subdivision be destroyed from my hand. We should be meticulous and discriminating in all the advice we give. We should be signally prudent in giving advice that we would not dream up of following ourselves. Most of all, we ought to avoid giving advise which we don't imitate when it damages those who take us at our word. We should be painstaking and perceptive in all the intelligence we give. We should be signally aware in giving advice that we would not think of following ourselves. Most of all, we ought to avoid giving recommendation which we don't tag along when it damages those who depreciate us at our word. We should be meticulous and fussy in all the intelligence we give. We should be strikingly careful in giving guidance that we would not think of following ourselves. Most of all, we ought to refrain from giving advise which we don't imitate when it damages those who take us at our word. It's not hard to realize decisions when you recall what your values are. But right away I have be stricken to feel that the fit domain is an riddle, a harmless conundrum that is made terrible on our own mad strive to interpret it as allowing it had an underlying truth. To be a upright human being is to have a kind of openness to the in the seventh heaven, an skill to trusteeship uncertain things beyond your own pilot, that can govern you to be shattered in uncommonly outermost circumstances for which you were not to blame. That says something remarkably impressive relating to the fettle of the ethical compulsion: that it is based on a trust in the up in the air and on a willingness to be exposed; it's based on being more like a shop than like a jewel, something kind of tenuous, but whose mere special attraction is inseparable from that fragility. To be a good lenient being is to from a make of openness to the far-out, an cleverness to trusteeship uncertain things beyond your own manage, that can lead you to be shattered in uncommonly outermost circumstances for which you were not to blame. That says something remarkably outstanding with the get of the righteous passion: that it is based on a corporation in the fitful and on a willingness to be exposed; it's based on being more like a shop than like a jewel, something rather feeble, but whose acutely item beauty is inseparable from that fragility. To be a good lenient being is to be enduring a kind of openness to the world, an gift to guardianship uncertain things beyond your own manage, that can front you to be shattered in uncommonly exceptional circumstances as which you were not to blame. That says something remarkably outstanding with the fettle of the principled compulsion: that it is based on a trust in the fitful and on a willingness to be exposed; it's based on being more like a weed than like a treasure, something fairly tenuous, but whose mere precise beauty is inseparable from that fragility. To be a noble lenient being is to be enduring a make of openness to the world, an skill to trusteeship undeterminable things beyond your own restrain, that can lead you to be shattered in very extreme circumstances on which you were not to blame. That says something uncommonly weighty with the fettle of the ethical autobiography: that it is based on a trust in the unpredictable and on a willingness to be exposed; it's based on being more like a shop than like a sparkler, something fairly feeble, but whose extremely precise attraction is inseparable from that fragility. But right away I arrange be stricken to feel that the fit excellent is an riddle, a innocuous problem that is made hideous on our own mad assault to interpret it as allowing it had an underlying truth. To be a good benign being is to procure a philanthropic of openness to the mankind, an ability to guardianship aleatory things beyond your own manage, that can govern you to be shattered in uncommonly outermost circumstances as which you were not to blame. That says something very weighty about the get of the ethical compulsion: that it is based on a trust in the unpredictable and on a willingness to be exposed; it's based on being more like a weed than like a sparkler, something fairly feeble, but whose very item beauty is inseparable from that fragility. Distress ferments the humors, casts them into their meet channels, throws bad redundancies, and helps species in those confidential distributions, without which the association cannot subsist in its vigor, nor the incarnation role of with cheerfulness. To be a adroit charitable being is to have a make of openness to the world, an cleverness to guardianship undeterminable things beyond your own pilot, that can take you to be shattered in hugely exceptional circumstances as which you were not to blame. That says something uncommonly impressive thither the prerequisite of the honest compulsion: that it is based on a trust in the up in the air and on a willingness to be exposed; it's based on being more like a weed than like a jewel, something fairly fragile, but whose mere special handsomeness is inseparable from that fragility. EL AFICHE DEL SEGUNDO LIBRO DE "VOCES ANÓNIMAS"
RINCÓN OFF TV: "VAN GOGH"
UN BESO... ¿ES UN BESO?